I’m a former 8th grade math/algebra teacher. I taught in Tampa, FL and Charleston, SC for 10 years. I have a bachelors in mathematics, a masters in mathematics education and a national board certification for early adolescence mathematics. I’m currently a mathematics assessment specialist in New Jersey. 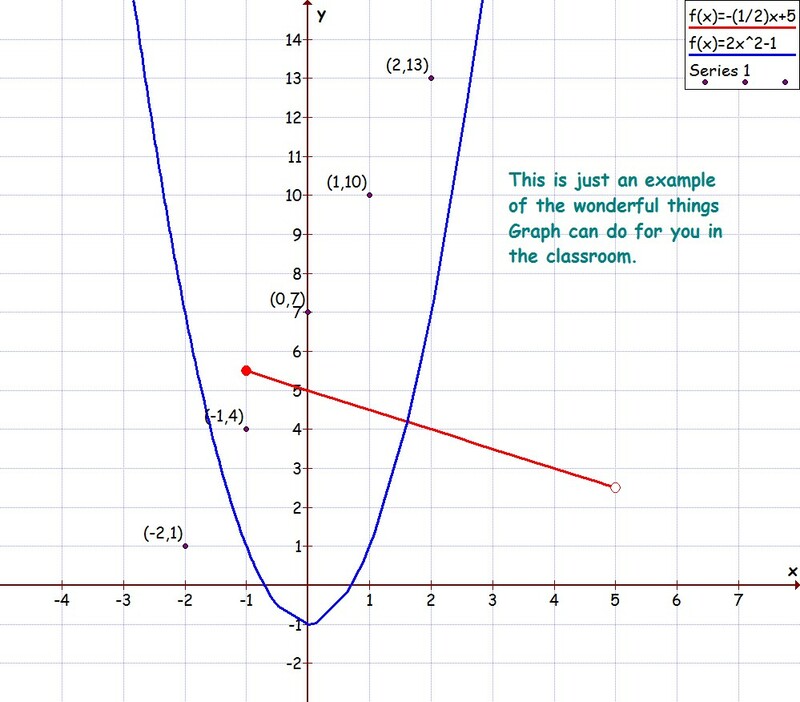 This is an excellent free graphing software. I use this quite frequently in the office when I need to sketch a quick example for an item. In the classroom it can be used to create your own custom graphs for instruction and assessments. Students can also benefit from this resource. SHARE! It’s very intuitive and easy to navigate. Graphs can be snagged and/or saved to insert into just about any type of document, including websites. Click the “Graph” link above and get started. Have fun! For many of you school has begun, and for the rest of you it will begin this week. It is such an exciting time for everyone. New beginnings! Everyone involved has some level of stress associated with beginning a new school year, parents, administrators, teachers, support staff, students, and yes, custodial staff. I’ve now been out of the classroom for my 3rd year, but my excitement and passion for success for all is still alive. I want to wish you all the best year ever. Plan, plan, plan and plan some more. Have a Plan A, Plan B, and a Plan C. This goes for everything content and non-content related. I know it’s difficult enough to have a documented lesson plan that’s required by your administrators or your subject leaders that must contain an enormous amount of detail, but having an informal outline, list of resources, and list of questions and activities for your “backups” is a must. Be flexible and don’t let’em see you sweat. On a school-wide scale, many new schedules and procedures are put into place, be it lunchroom schedule, recess and break schedule, traffic patterns or bus release plan. Show patience and flexibility to handle things when they don’t go according to the desired plan. When working with hundreds of students at a time with many factors in play that can affect the execution of the plan, “stuff” happens. Keep in mind that the students’ safety and well-being is your first priority. Keep a cool head, keep the students under control and happy, keep a smile and everything will work out. Stay on top of things as they come in. The beginning of the year is a busy, busy time; however, there are critical deadlines that need to be met. This may include the return of student paperwork/information, schedule changes, work requests, parent correspondence, website authoring, setting up grade book, and any required online courses/learning activities. Give EVERY student a chance. Please, regardless of what you know about your students before they enter your classroom, allow each and every student a clean slate. Provide them an opportunity to make a change if it’s in their hearts. Too often students simply live up to the expectations we set for them. If you truly want your students to live up to their potential, let them start fresh. With that said, I want to caution you on saying one thing to the whole class because it sounds great, but treat individual students differently when others are not around. There’s no faster way to break the trust of not only that one student, but virtually every student you teach and everyone they know. Word will get around that your word is no good, and it will stick with students forever. Rely on your professional peers and administrators. Ask for help when you need it. Find those peers that welcome questions and discussion. Brainstorm with subject-similar colleagues for instructional and disciplinary strategies. Don’t fall into the pit of the negative talk and gossip. Everyone has problems. Find solutions for yourself and listen other’s problems when they need it. Realize that you should only provide advice to those peers who want to listen to your suggestions; otherwise it will fall on deaf ears and potentially fuel jealousy and animosity. Educators should behave as a team, but as in every team, not everyone is a team player. I hope this helps you have a great new year. Please send me your questions or concerns. I’m here for you. I can be a sounding board and someone you can brainstorm with. I taught middle school math/algebra for 10 years. I’m happy to help. Best of luck! I get very upset when I hear students regurgitate rules for mathematical properties, but have no sense of why the rule exists. To be quite honest with you, it wasn’t until my second year of math education courses that I understood why a negative exponent essentially had the base and the positive version of the exponent end up in the denominator of a fraction. When I came across a negative exponent in the denominator of a fraction, I was quite befuddled. I essentially made up a new rule, when it’s negative in the “bottom”, I must take to the “top”. Yeah, that fixes everything, right? Not quite. Students are forever making up rules as they go along, adding to and modifying what they have been told in the past, creating bandaids of sorts to get them through to the next round. How about we step back and give a logical reason for things, so students build upon and apply knowledge, instead of inventing their own. Please take a look at this short piece that explains the effects of taking a base to a negative exponent. Every student needs to understand this reason. What an amazing set of blogs! Which activities are your favorite? There are so many ideas here that can be replicated throughout the algebra curriculum. Just because your students are essentially teenagers, they still want to get up out of their seat and learn in a fun interactive way. Don’t deprive them! Let’s get creative!!!! I’m so happy I follow @Maths_Masters on Twitter! Such wonderful resources! I must share this one with my algebra teachers. Quadratic Equations – The Main Ideas. Better yet, give students the Group 1 through 5 titles from the card sort first and see if they can generate facts for each of them while working in groups of 3 or 4 first. After they have exhausted their knowledge, provide them with the card sort to work out. Finally, have the students, still within their small groups, compare what they came up with with this card sort. While students may not be able to generate all of the facts on their own, nor be able to word their facts as succinctly, the ownership students will experience when they connect what they wrote to the facts on the cards will be immeasurable. Thank you William Emeny at http://www.greatmathsteachingideas.com/ ! Check this out…modify to your needs…and make your life easier! This has worked quiet well as a school wide discipline plan for several schools. As the year winds down it’s important to analyze what has worked and what has not worked. This may be something you’d like to adopt for next year. Start bringing key players on board now to make this a smooth transition for the fall. This is such an amazing set of tutorials and lessons on how to use GeoGebra! I used this program for my graduate program and fell in love. Every school should have this installed on every computer for students to use to investigate, create, and verify geometric concepts. Please share with your teachers, parents and students. Thank you Mathematics and Multimedia! Math is just a different type of subject. It requires a unique balance between memorizing facts, following procedures, problem solving and reasoning. More often than not, these aspects intertwine no matter what age, grade or course. I want to focus on what students can do on their own to help with these skills when you’re not present, i.e. when working at home or in school with a substitute. Learning and practicing independently should be a routine for students. As a teacher, you must teach them how to do this effectively. It’s important to having clear, defined actions that students can practice when you are present, so that they will understand what to do when you’re not. Here are a few suggestions that you can modify to fit your current classroom note taking structure. If you do not have a current note taking structure, maybe this will be motivation to create one. See Helping Students Stay Organized for ideas. The course binder should be thought of as a record of learning and achievement, as well as information pertaining to the content. Chances are students have made mistakes along the way on assignments or assessments, or have had misconceptions at one point or another. Often teachers get into a routine of teaching, testing, teaching, and more testing. There’s no time set aside for reviewing, reflecting, or reassessing. Reviewing only seems to happen when a subset of skills are passed along to the next chapter. Reassessing may happen on 20-30% of the concepts as a residual effect of the natural sequence of learning mathematics, but never in a capacity that would allow teachers to really determine if true learning has occurred. Lastly, students rarely have the opportunity, or take the opportunity, to reflect on their personal learning and growth on a concept, chapter or unit. This is the area in which students need a great deal of guidance in order to gain the most out of their education. While in a perfect world it would be wonderful to conference with each and every child after an assessment, to explain, reteach and reassess, or simply have a conversation with the child to gain an understanding of their thought process on particular questions, it’s impossible to do so. It’s imperative to teach students how to assess their own learning, investigate on their own using the tools you have provided them, as well as using outside resources like parents, siblings, and online resources. Before this can occur, you must teach students to value their learning, and essentially fight for understanding in cases when it is not been reached. It’s only through this desire for understanding that students will be motivated to learn from their mistakes. When a student takes an assessment of any kind, quick checks, daily assignments, formative assessments like chapter tests, or summative assessments like semester or end of year exams, it’s a snapshot of what the student knows at that point in time. Results are usually recorded in the fashion of points or percentages. Regardless of the type of assessment, for most students 100% performance has not been achieved. There is always room for further understanding. This understanding will only come through review, relearning, and reflecting. Have students individually review their assignment/quiz/test, absorb the results, and record in writing their initial feelings and frustrations, as well as identified mistakes or misconceptions. Often times students want to seek your immediate assistance in understanding why they lost points or missed a problem. Teach students to do this step individually first for maximum benefits. As a side note, while I feel strongly about writing across the curriculum, this is not the place for students to feel added pressure and stress with perfecting their spelling, grammar and sentence structure. Allow for lists of comments, ideas or questions to get this aspect of the process accomplished. Have students to ask their questions pertaining to the particular problems they did not understand and had points deducted. First give other students in class the opportunity to respond to these questions. This is a valuable tool to use in this instance. Allow the student who just reached an understanding of his/her own mistake explain another student’s misconception. Wow! How powerful is that? Not only is the student who asked the question, getting his/her question answered, but the student who just had a major revelation is given the opportunity to verbalize his/her understanding. Relying on students who initially understood the problem to provide an explanation is just as effective. Of course, if this opportunity does not arise, you can certainly take the role of explaining the problem or concept to the class yourself. After all questions have been answered, students are to formally correct all of the partially or completely missed problems on a new sheet of paper. These corrections would have the problem, including word problems, and problems with graphs and geometric art, and the correct process to achieve the solution. The student should be able to look back at this problem on this formal correction sheet and have all the necessary information to answer it completely. Below the formal rework of each problem missed, have students summarize their misconception, mistake, or new-found knowledge. Students may want to read what they wrote on Step 1 to reflect on their learning up to this point. They may speak of a simple calculation error, misuse of a formula, an incomplete process, or a total lack of understanding at the time of the assignment/quiz/test. Remind them that this is a form of documentation of their learning. They need to write clearly and completely. This piece is more formal than was done during Step 1. Students should be encouraged to pose further questions in order for them to gain deeper understanding of that particular concept in that problem. These new questions can be brought out in class discussions or one-on-one with the teacher. Flagging these questions with a post-it note may emphasize to students to follow up with the teacher or class. Understand this is difficult to do on every assignment and task students complete. Targeting a subset of problems, either at the beginning of a unit after base knowledge has been taught, or at the end of a chapter for an overall student evaluation would be more manageable and possibly more effective. I hesitate to recommend this type of student reflection be tied to a grade of sorts. While students are somewhat motivated to complete assignments because there is a grade attached to it, the purpose of this is to have students examine what it is they know and what information they misunderstood or lacked. This is a discipline. Students have to experience success from of this type of reflection before they buy into the regimen. Teachers should providing non-evaluative, mathematical feedback that is positive and encourages a dialog between student and teacher. If students feel as though this is just another hoop to jump through to get a grade, it becomes a chore and fails as an effective process. In doing some reading on current technologies in mathematics classes, I came across Mathtrain.TV, wonderful resource created by students for students. These are short 5 minutes or less videos that students created to instruct on particular math content such as solving multistep equations or graphing linear equations. Teachers can also create short tutorials and post them to their school website to share with students and their parents. To get started simply download the free software Jing at TechSmith.com. A stylus and tablet would be best for mathematics content, but not necessary. The videos are saved to your personal webpage on Screencast.com . Each video can be saved in folders and can be secured individually depending on the intended audience. If students have access to a particular folder, they can see any video saved within the folder. I see this working very well with a folder for each course you teach, i.e. 7th grade math, 8th grade math, Algebra I, or a folder for each class period. There’s so many opportunities to explore! Feel free to contact me with questions, comments or concerns. Happy New Year everyone!! !